1.1 Approximation of Continuous Functions by Polynomials on a Finite Segment. Theory of Approximation of Functions of a Real Variable discusses a number of fundamental parts of the modern theory of approximation of functions of a real variable. The material is grouped around the problem of the connection between the best approximation of functions to their structural properties. This text is composed of eight chapters that highlight the relationship between the various structural properties of real functions and the character of possible approximations to them by polynomials and other functions of simple construction. 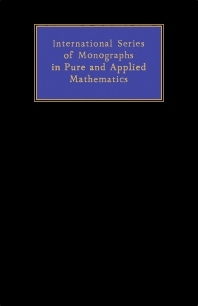 Each chapter concludes with a section containing various problems and theorems, which supplement the main text. The first chapters tackle the Weierstrass's theorem, the best approximation by polynomials on a finite segment, and some compact classes of functions and their structural properties. The subsequent chapters describe some properties of algebraic polynomials and transcendental integral functions of exponential type, as well as the direct theorems of the constructive theory of functions. These topics are followed by discussions of differential and constructive characteristics of converse theorems. The final chapters explore other theorems connecting the best approximations functions with their structural properties. These chapters also deal with the linear processes of approximation of functions by polynomials. The book is intended for post-graduate students and for mathematical students taking advanced courses, as well as to workers in the field of the theory of functions.